April 12th – April 19th. Ephesians 6:10-18 gives us great insight and instruction. I have included in our portion today the armor of God and word declarations that I pray on a regular basis over myself and those I am connected with. I have been decreeing this word over you during the 70 Days. Remember, there is a war going on in the heavenlies! So, let us put on the whole armor of God and having done all to stand, STAND! Father, clothe me with the armor of light, the Blood of Jesus, the armor of Jesus. (Eph. 6:10-18) I put on the belt of truth, the breastplate of righteousness, the shoes of the gospel of peace, I take up the shield of faith to extinguish all the fiery darts of the enemy, I put on the helmet of salvation, and wield the sword of the Spirit, which is the Word of God. And I pray in the spirit. I bind myself to the Truth who is Jesus. Lord, you are the way, the truth, and the life. It is written I know the truth and the truth sets me free. I receive the gospel of truth- the gospel of my Salvation. Holy Spirit of Truth permeate my being. I bind myself to the Righteousness of my God in Christ Jesus. I am established in righteousness, oppression is far from me, I have nothing to fear. Terror is far removed; it will not come near me. If anyone or thing attacks me, it is not the doing of the Lord; whoever and whatever attacks me has to surrender to me in the Name of Jesus Christ. No weapon formed against me will prosper and I refute every tongue that would rise to accuse me. “This is the heritage of the saints and their vindication is of me says the Lord.” I love righteousness and hate wickedness, therefore the Lord has set me above my companions by anointing me with the oil of gladness. I am clothed with the crown of beauty instead of ashes, the oil of gladness instead of mourning and the garment of praise instead of the spirit of despair. My God has clothed me with the Robe of Righteousness. Holy Spirit of Righteousness permeate my being. I bind myself to the Peace of the Lord Jesus Christ. My God is the God of peace who crushes satan under my feet. I fix my eyes and my thoughts upon Jesus Christ who is the author and finisher of my faith. I set my heart and mind upon things above – where I am seated at the right hand of the Father in Christ Jesus. My mind is steadfastly fixed upon things above. I rejoice in the Lord always, I am anxious for nothing. By prayer and petition, with thanksgiving, I present my request to God and the peace that passes all understanding guards my heart and mind in Christ Jesus. I receive righteousness, peace, and joy in the Holy Ghost. Let your peace rule within my heart and within the walls of my home and city. Holy Spirit of peace permeate my being. I bind myself to the faith of the Son of God and renounce doubt, unbelief, fear and discouragement. I agree with God’s Word to be not afraid and be not discouraged. I am crucified with Christ and I know longer live, Christ lives in me. The life I live in the body – I live by the faith of the Son of God. I am strong in the Lord and very courageous. Holy Spirit of faith permeate my being. I bind myself to the Salvation of the Lord Jesus Christ. I bind my mind, will, and emotions to the Will, Word, and Way of God. I bind my mind to the mind of Christ, that the very thoughts, feelings and purposes of His heart would be within my thoughts. Father, pour out your Spirit of Wisdom and Revelation that I may know you better. That the very eyes of my heart would be enlightened in order that I may know the hope to which you have called me, the riches of Your glorious inheritance in the saints, and Your incomparably great power for us who believe. Father, thank you for ears that hear and eyes that see and heart that understands. The weapons of my warfare are not carnal, but mighty through God to the pulling down of strongholds, I cast down imaginations, and every high thing that would exalt itself against the knowledge of God in my life. I command my thoughts to become captive to the obedience of Christ. I bind myself to the completed work of the cross with all of its mercy, grace, love, forgiveness and dying to self. I am loosed from every old, wrong, ungodly pattern of thinking, attitude, idea, desire, belief, motivation, habit and behavior and any strongholds in my life. Holy Spirit of the New Covenant – I give you the tablets of my heart and mind. Write the Word of God on them. Holy Spirit permeate and clothe me with Salvation, deliverance, healing, and prosperity in Jesus Name. I am wearing the garments of Salvation. I bind myself to the Word of God. The Word of God is living and active. Sharper than any double-edged sword, it penetrates even to dividing soul and spirit, joints and marrow; it judges the thoughts and attitudes of my heart. My God gives me words and wisdom that my adversaries will not be able to resist or contradict. I am wise as a serpent and as innocent as a dove. Father, clothe me with Your power from on high, Jesus, baptize me and fill me afresh with the Holy Spirit and Fire. Let your rivers of living water flow out of my inmost being. I call my spirit man to attention to rise up and rule in Your true righteousness and holiness. I release Your light and glory and all that you have stored within me to flow out. I release the dunamis power of God to flow out of my spirit and permeate my being. I release your exousia- the jurisdiction of the Kingdom of God to come in me and through me establishing the rule of the Kingdom of God on earth as it is in heaven. I release your kratos power – Kingdom Dominion to flow in me and out of me and into my spheres of influence. I thank you that you strengthen me in my inner man by the power of Your Holy Spirit. The law of the Spirit of Life in Christ Jesus has set me free from the law of sin and death. I receive resurrection, power and life through the broken body, shed blood and resurrection of Jesus Christ. I align myself with Father God, Jesus, Holy Spirit, the Kingdom of God. I speak to the heavens and command them to be opened over my life and land. Let your kingdom come, let your will be done on earth as it is in heaven in the lives of your people this day. I receive and release the kingdom of God, the ministry of the Holy Spirit, and the ministry of angels into my life this day. Decree the Preamble of the State of New Mexico: We, the people of New Mexico, grateful to Almighty God for the blessings of liberty, in order to secure the advantages of a state government, do ordain and establish this constitution. Father, we come into agreement with your Kingdom plan and redemptive purposes for our nation and the State of New Mexico. We call New Mexico into the original intent of her birthright and destiny as ordained by Almighty God. Lord, plumb line this state in your righteousness. Let this state come to her senses and rise-up in her true identity. Let the foundation of all unrighteous government completely crumble in this state. Let your light shine in this state and expose the darkness. Mercy, Lord! Mercy Lord! Hear the cry of the righteous and bring the state of New Mexico into your redemptive plan. We lift up the name of Jesus Christ of Nazareth over this nation and the state of New Mexico. Lord, draw the people unto salvation by your Spirit. Father, thank you for the righteous remnant that is still holding the line in New Mexico. There is a war going on in the heavenlies and we are tearing down wicked principalities and we are raising up righteousness!. Lord, pour out your loving-kindness on this state and let your goodness lead her to repentance. Hear the heart cry of your remnant! Let the worshipers in this state arise. New Mexico, you are a The Supernatural State. We say let the revolutionary spirit of the Lord be released within you! Lord we release your light, righteousness, goodness, and truth to the state of New Mexico. We believe to see your goodness in the land of the living in the state of New Mexico and in our nation. In the Name of Jesus Christ, Amen. Dutch Sheets declared Isaiah 35 over New Mexico. He declared that the desert will bloom. The following cumulative prophecy came forth: “The moving of My Spirit is on this land, and the first fruits of My Spirit will be manifested here. There will be an outbreak of the supernatural, with a first fruit’s demonstration of miracles. Welcome My Spirit, for there are many spirits in this land. I am the Revelator. From this day forth, the prophets will be able to sound a clear trumpet in New Mexico. Watch the winds for they are a sign. Don’t hide yourself from the wind but allow the wind to blow away that which has grown dusty. Many who have come into the supernatural, but not by My Spirit, will now come into My Kingdom. I will bring in the witches and the warlocks, and a great conversion of those that have experienced the supernatural dimension of the enemy. I am getting ready to bring them in and raise up prophets in your midst. Current leaders who stand in My pulpit, will stand to speak, but the spirit of prophecy will come upon them. I am releasing mysteries, strategies and revelation. Cry out for the leaders of this state to receive the prophetic mantle. New Mexico will surprise the nation! The hidden will be revealed. A supernatural “something” will happen that will shift the economy of this state. This is a time of springing forth in New Mexico. Have faith for the pueblos for I will invade them with faith. Death and destruction has been in this state, but faith is coming to the pueblos. Invite faith into the pueblos!” (Releasing The Prophetic Destiny of a Nation) In Jesus Name, Amen! We are partnering with VISUALEAST.ORG in 8 Days of Communion for the last eight days of our 70 Day Decree Raising Up Righteousness. 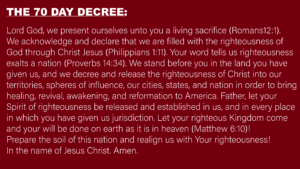 This will be a powerful finish to the decree. Our dear friend, Priscilla Zananiri, will be sharing a post daily. You can follow along at visualeast.org. Communion Elements are needed – Salt, Bread, and Grape Juice/ Wine. Join Priscilla at 7:30 PM (Central Time) live on Facebook for corporate communion. You can participate in that on her Facebook page –Priscilla Zananiri.